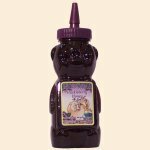 Huckleberry Havens Gourmet Huckleberry Clover honey flavored with Wild Huckleberry Puree. Deliciously flavored, add to your favorite tea, on your favorite breads, with your peanut butter sandwich and so many other great ways to enjoy! We meticulously prepare our time-honored recipes in small batches to highlight the intensely delectable flavors of the Northwest. The sweet robust flavors of these unique Wild Berries are indigenous to the higher elevations of the Rocky Mountains. Every Wildberry grows naturally in the forest, completely unattended until individually hand-picked each summer. These berries have never sucessfully been commercially cultivated and therefore are limited in availability and highly desirable.